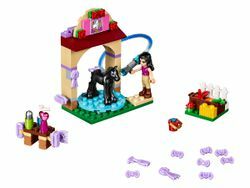 41123 Foal Washing Station is a Friends set released in 2016. Pamper Emma's cute pet foal at the Foal's Washing Station! Emma is getting Diamond the foal ready for her first horse show. Give her a good wash with the hose and special horse shampoo before grooming her with the brushes and combs. Then give Diamond an apple while you put a pretty bow in her mane—she's been such a good girl! Includes an Emma mini-doll figure in jodhpurs, plus a black foal. Features a Horse Washing Station with turntable and flexible hose, a display table for grooming products and a feeding area with a storage crate. Accessory elements include a bucket, grooming brushes, spray bottle, horse soap bottles, hair decorations, apple and a carrot. Wash Diamond down using the flexible hose and the horse shampoo bottles. Lead the foal onto the turntable and gently rotate it to make sure she's groomed and gleaming all over. This set offers an age-appropriate building experience for ages 5-10. Horse Washing Station measures over 3” (9cm) high, 2” (6cm) wide and 2” (6cm) deep. Display table measures under 1” (1cm) high, 1” (2cm) wide and 1” (1cm) deep. Feeding area measures over 1” (3cm) wide, 1” (3cm) deep and under 1” (2cm) high. Combine with the 41126 Heartlake Riding Club to get ready for a Heartlake horse show. Facts about "41123 Foal Washing Station"
This page was last edited on 9 February 2019, at 18:03.